Not to be confused with Ferrimagnetism. A magnet made of alnico, an iron alloy, with its keeper. Ferromagnetism is the basic mechanism by which certain materials (such as iron) form permanent magnets, or are attracted to magnets. In physics, several different types of magnetism are distinguished. Ferromagnetism (along with the similar effect ferrimagnetism) is the strongest type and is responsible for the common phenomena of magnetism in magnets encountered in everyday life. Substances respond weakly to magnetic fields with three other types of magnetism—paramagnetism, diamagnetism, and antiferromagnetism—but the forces are usually so weak that they can only be detected by sensitive instruments in a laboratory. An everyday example of ferromagnetism is a refrigerator magnet used to hold notes on a refrigerator door. The attraction between a magnet and ferromagnetic material is "the quality of magnetism first apparent to the ancient world, and to us today". Permanent magnets (materials that can be magnetized by an external magnetic field and remain magnetized after the external field is removed) are either ferromagnetic or ferrimagnetic, as are the materials that are noticeably attracted to them. Only a few substances are ferromagnetic. The common ones are iron, cobalt, nickel and most of their alloys, and some compounds of rare earth metals. 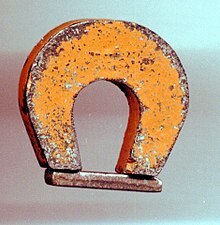 Ferromagnetism is very important in industry and modern technology, and is the basis for many electrical and electromechanical devices such as electromagnets, electric motors, generators, transformers, and magnetic storage such as tape recorders, and hard disks, and nondestructive testing of ferrous materials. Historically, the term ferromagnetism was used for any material that could exhibit spontaneous magnetization: a net magnetic moment in the absence of an external magnetic field. This general definition is still in common use. In the special case where the opposing moments balance completely, the alignment is known as antiferromagnetism; but antiferromagnets do not have a spontaneous magnetization. The table above lists a selection of ferromagnetic and ferrimagnetic compounds, along with the temperature above which they cease to exhibit spontaneous magnetization (see Curie temperature). Most ferromagnetic materials are metals, since the conducting electrons are often responsible for mediating the ferromagnetic interactions. It is therefore a challenge to develop ferromagnetic insulators, especially multiferroic materials, which are both ferromagnetic and ferroelectric. In 2009, a team of MIT physicists demonstrated that a lithium gas cooled to less than one kelvin can exhibit ferromagnetism. The team cooled fermionic lithium-6 to less than 150 nK (150 billionths of one kelvin) using infrared laser cooling. This demonstration is the first time that ferromagnetism has been demonstrated in a gas. In 2018, a team of University of Minnesota physicists demonstrated that body-centered tetragonal ruthenium exhibits ferromagnetism at room temperature. One of the fundamental properties of an electron (besides that it carries charge) is that it has a magnetic dipole moment, i.e., it behaves like a tiny magnet, producing a magnetic field. This dipole moment comes from the more fundamental property of the electron that it has quantum mechanical spin. Due to its quantum nature, the spin of the electron can be in one of only two states; with the magnetic field either pointing "up" or "down" (for any choice of up and down). The spin of the electrons in atoms is the main source of ferromagnetism, although there is also a contribution from the orbital angular momentum of the electron about the nucleus. When these magnetic dipoles in a piece of matter are aligned, (point in the same direction) their individually tiny magnetic fields add together to create a much larger macroscopic field. These unpaired dipoles (often called simply "spins" even though they also generally include orbital angular momentum) tend to align in parallel to an external magnetic field, an effect called paramagnetism. Ferromagnetism involves an additional phenomenon, however: in a few substances the dipoles tend to align spontaneously, giving rise to a spontaneous magnetization, even when there is no applied field. The exchange interaction is related to the Pauli exclusion principle, which says that two electrons with the same spin cannot also be in the same spatial state (orbital). This is a consequence of the spin-statistics theorem and that electrons are fermions. Therefore, under certain conditions, when the orbitals of the unpaired outer valence electrons from adjacent atoms overlap, the distributions of their electric charge in space are farther apart when the electrons have parallel spins than when they have opposite spins. This reduces the electrostatic energy of the electrons when their spins are parallel compared to their energy when the spins are anti-parallel, so the parallel-spin state is more stable. In simple terms, the electrons, which repel one another, can move "further apart" by aligning their spins, so the spins of these electrons tend to line up. This difference in energy is called the exchange energy. Electromagnetic dynamic magnetic domain motion of grain oriented electrical silicon steel. The above would seem to suggest that every piece of ferromagnetic material should have a strong magnetic field, since all the spins are aligned, yet iron and other ferromagnets are often found in an "unmagnetized" state. The reason for this is that a bulk piece of ferromagnetic material is divided into tiny regions called magnetic domains (also known as Weiss domains). Within each domain, the spins are aligned, but (if the bulk material is in its lowest energy configuration; i.e. unmagnetized), the spins of separate domains point in different directions and their magnetic fields cancel out, so the object has no net large scale magnetic field. Moving domain walls in a grain of silicon steel caused by an increasing external magnetic field in the "downward" direction, observed in a Kerr microscope. White areas are domains with magnetization directed up, dark areas are domains with magnetization directed down. Thus, a piece of iron in its lowest energy state ("unmagnetized") generally has little or no net magnetic field. However, the magnetic domains in a material are not fixed in place; they are simply regions where the spins of the electrons have aligned spontaneously due to their magnetic fields, and thus can be altered by an external magnetic field. If a strong enough external magnetic field is applied to the material, the domain walls will move by the process of the spins of the electrons in atoms near the wall in one domain turning under the influence of the external field to face in the same direction as the electrons in the other domain, thus reorienting the domains so more of the dipoles are aligned with the external field. The domains will remain aligned when the external field is removed, creating a magnetic field of their own extending into the space around the material, thus creating a "permanent" magnet. The domains do not go back to their original minimum energy configuration when the field is removed because the domain walls tend to become 'pinned' or 'snagged' on defects in the crystal lattice, preserving their parallel orientation. 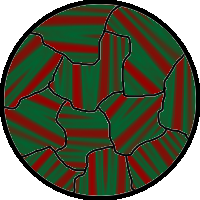 This is shown by the Barkhausen effect: as the magnetizing field is changed, the magnetization changes in thousands of tiny discontinuous jumps as the domain walls suddenly "snap" past defects. Commercial magnets are made of "hard" ferromagnetic or ferrimagnetic materials with very large magnetic anisotropy such as alnico and ferrites, which have a very strong tendency for the magnetization to be pointed along one axis of the crystal, the "easy axis". During manufacture the materials are subjected to various metallurgical processes in a powerful magnetic field, which aligns the crystal grains so their "easy" axes of magnetization all point in the same direction. Thus the magnetization, and the resulting magnetic field, is "built in" to the crystal structure of the material, making it very difficult to demagnetize. ^ Chikazumi, Sōshin (2009). Physics of ferromagnetism. English edition prepared with the assistance of C.D. Graham, Jr (2nd ed.). Oxford: Oxford University Press. p. 118. ISBN 9780199564811. ^ Bozorth, Richard M. Ferromagnetism, first published 1951, reprinted 1993 by IEEE Press, New York as a "Classic Reissue." ISBN 0-7803-1032-2. ^ Somasundaran, P., ed. (2006). Encyclopedia of surface and colloid science (2nd ed.). New York: Taylor & Francis. p. 3471. ISBN 9780849396083. ^ Cullity, B.D. ; Graham, C.D. (2011). "6. Ferrimagnetism". Introduction to Magnetic Materials. John Wiley & Sons. ISBN 9781118211496. ^ Aharoni, Amikam (2000). Introduction to the theory of ferromagnetism (2nd ed.). Oxford: Oxford University Press. ISBN 9780198508090. ^ Kittel, Charles (1986). Introduction to Solid State Physics (sixth ed.). John Wiley and Sons. ISBN 0-471-87474-4. ^ Hill, Nicola A. (2000-07-01). "Why Are There so Few Magnetic Ferroelectrics?". The Journal of Physical Chemistry B. 104 (29): 6694–6709. doi:10.1021/jp000114x. ISSN 1520-6106. ^ Lander GH, Lam DJ (1976). "Neutron diffraction study of PuP: The electronic ground state". Phys. Rev. B. 14 (9): 4064–67. Bibcode:1976PhRvB..14.4064L. doi:10.1103/PhysRevB.14.4064. ^ Aldred AT, Dunlap BD, Lam DJ, Lander GH, Mueller MH, Nowik I (1975). "Magnetic properties of neptunium Laves phases: NpMn2, NpFe2, NpCo2, and NpNi2". Phys. Rev. B. 11 (1): 530–44. Bibcode:1975PhRvB..11..530A. doi:10.1103/PhysRevB.11.530. ^ a b Mueller MH, Lander GH, Hoff HA, Knott HW, Reddy JF (Apr 1979). "Lattice distortions measured in actinide ferromagnets PuP, NpFe2, and NpNi2" (PDF). J Phys Colloque C4, supplement. 40 (4): C4–68–C4–69. ^ G-B Jo; Y-R Lee; J-H Choi; C.A. Christensen; T.H. Kim; J.H. Thywissen; D.E. Pritchard; W. Ketterle (2009). "Itinerant Ferromagnetism in a Fermi Gas of Ultracold Atoms". Science. 325 (5947): 1521–24. arXiv:0907.2888. Bibcode:2009Sci...325.1521J. doi:10.1126/science.1177112. PMID 19762638. ^ Quarterman, P.; Sun, Congli; Garcia-Barriocanal, Javier; DC, Mahendra; Lv, Yang; Manipatruni, Sasikanth; Nikonov, Dmitri E.; Young, Ian A.; Voyles, Paul M.; Wang, Jian-Ping (2018). "Demonstration of Ru as the 4th ferromagnetic element at room temperature". Nature Communications. 9. Bibcode:2018NatCo...9.2058Q. doi:10.1038/s41467-018-04512-1. ^ Feynman, Richard P.; Robert Leighton; Matthew Sands (1963). The Feynman Lectures on Physics, Vol. 2. Addison-Wesley. pp. Ch. 37. ^ Chikazumi, Sōshin (2009). Physics of ferromagnetism. English edition prepared with the assistance of C.D. Graham, Jr (2nd ed.). Oxford: Oxford University Press. pp. 129–30. ISBN 9780199564811. ^ Assadi, M.H.N; Hanaor, D.A.H (2013). "Theoretical study on copper's energetics and magnetism in TiO2 polymorphs" (PDF). Journal of Applied Physics. 113 (23): 233913. arXiv:1304.1854. Bibcode:2013JAP...113w3913A. doi:10.1063/1.4811539. ^ Aharoni, Amikam (1996). Introduction to the Theory of Ferromagnetism. Clarendon Press. ISBN 0-19-851791-2. Archived from the original on 2011-06-29. ^ Feynman, Richard P.; Robert B. Leighton; Matthew Sands (1963). The Feynman Lectures on Physics, Vol. I. Pasadena: California Inst. of Technology. pp. 37.5–37.6. ISBN 0465024939.